Posted on November 30, 2018 by David M.
The sun greeted us in the Gloucester Crossing shopping center parking lot on Wednesday, as Susan Yurkus and I got ready to lead a cheery group of birders around Cape Ann. It was easy to get to the Jodrey State Fish Pier from there, and we found lots of birds in Gloucester Harbor. There were rafts of adult Common Eiders, with Double-crested Cormorants on the raft, and Red-breasted Mergansers scattered all over. Participant Hazel Hewitt picked out a female Common Merganser among them, making good use of our lesson on the differences between those species as “quiz birds” last week. 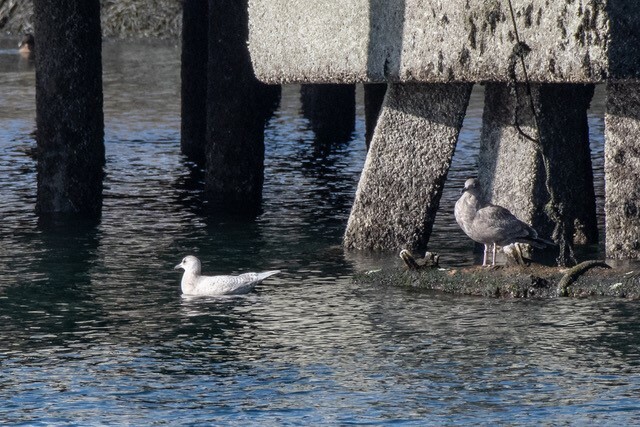 After one particularly big explosion of gulls from the fishermen’s warehouse, we had a happy result to my plea that people look for an unusual gull: we found a first-cycle Iceland Gull, which then spent a good amount of time paddling serenely around in the protected area near the pier. As we wound through the thicket at Eastern Point, a Hermit Thrush did what they often do, dashing in front of the lead van into the brush, after which no one else could get a look. The view of the outer harbor and nearby cove from Eastern Point Wildlife Sanctuary was very birdy, especially with Red-breasted Mergansers. Lots of Bufflehead bobbed and dove near the shore. A female Green-winged Teal joined them on the open water, allowing us to see both the smallest dabbler and the smallest diver together. 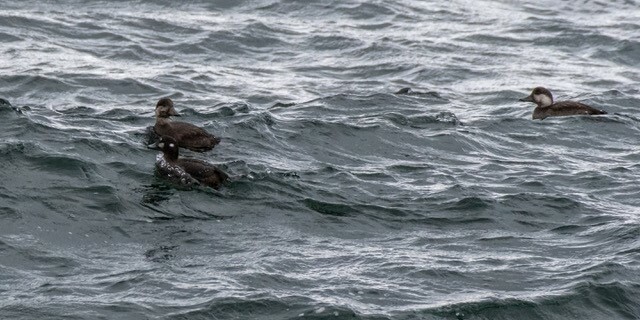 Not far out was a group of five or so beautiful drake Surf Scoters in a boys’ club gathering. 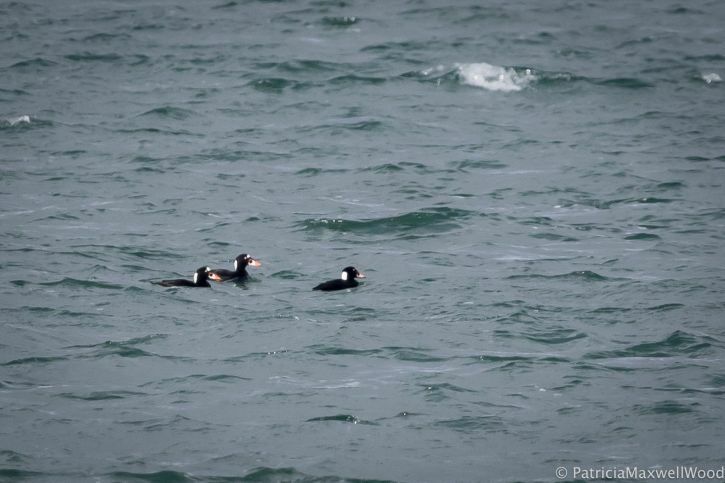 Mostly female Black Scoters and a Red-necked Grebe mixed in with a raft of eiders against the seawall. Niles Pond continued the theme of Red-breasted Mergansers, with one more Common Merganser female. 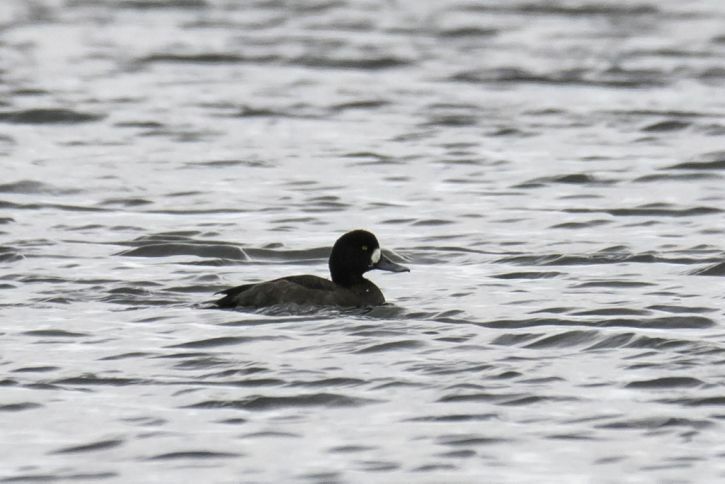 A Ring-necked Duck and a pair of Greater Scaup added diversity. We can’t say that a Mute Swan didn’t contribute as well. That is the spot where we usually find the few passerines we can report on Cape Ann. This week all that showed up was a Downy Woodpecker and a Song Sparrow, with cheeping from House Sparrows in the hedges. Driving up Atlantic Road begins with Cormorant Rock, which this time was devoid of Great Cormorants. 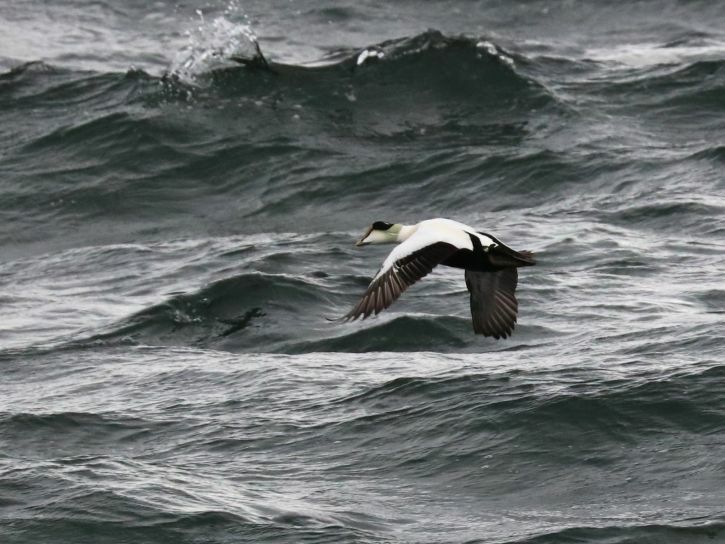 But the sea was covered with eiders and mostly White-winged Scoters. 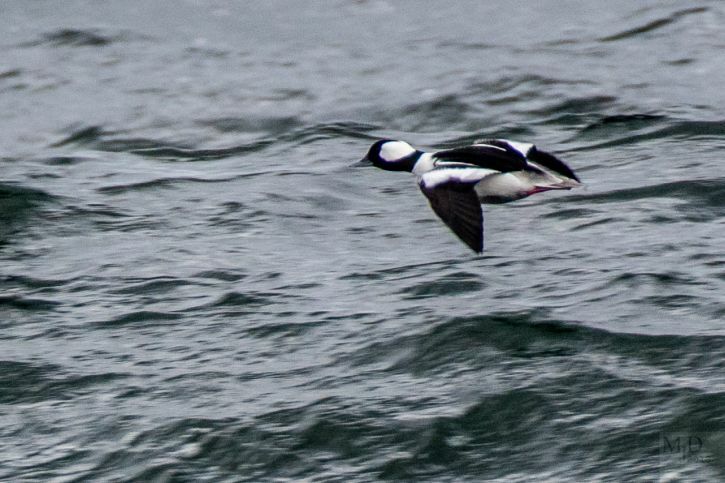 A charming aspect of the rocks and cove near the Elks Club is that Buffleheads are usually there in numbers, and this week was no exception. 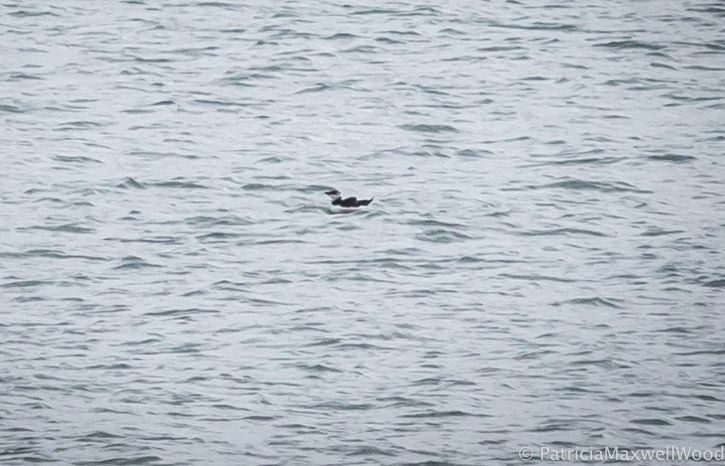 They made it more challenging for everyone to find a Razorbill; Hazel got even more kudos for finding one among them. Before we left, a Great Cormorant flew north way out at sea, not a bird easy to identify for most of us. 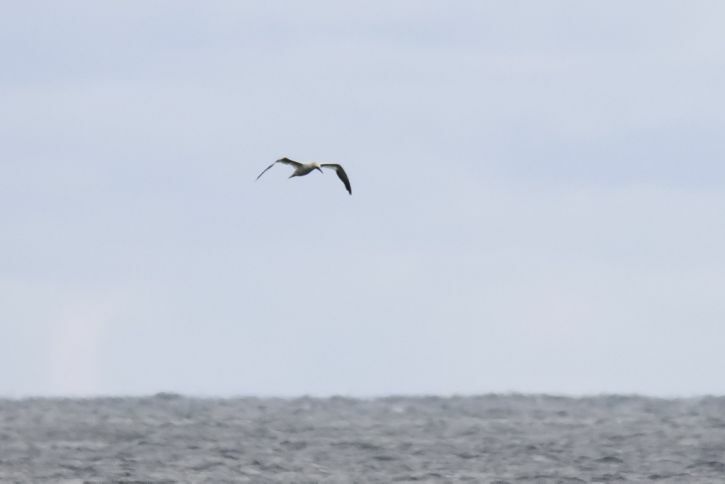 Northern Gannets also patrolled in ones and twos on the distant stretches of ocean. With not much time to spare, we made an efficient stop for the public restrooms at Rockport Harbor and found four American Black Ducks mixed in with the Mallards among the boats. The weather was changing by the time we reached Andrews Point, with a rising wind and gray sky that eventually produced a driving sleet. 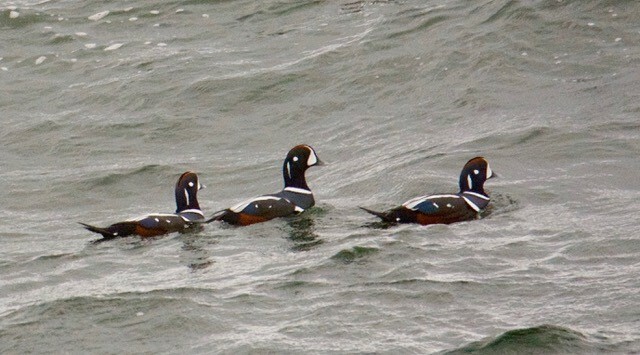 Still, it was wonderful to watch the big beautiful waves rolling in from the southeast and highlighting the many Harlequin Ducks and eiders below the point. 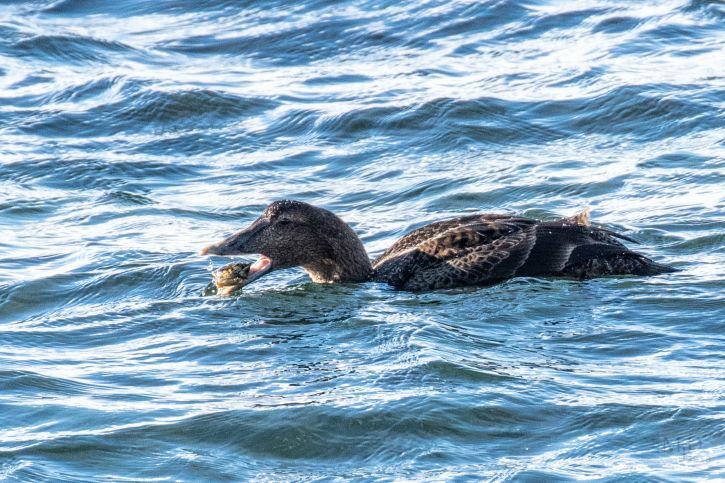 Before climbing back into the vans, we worked on differentiating female Black Scoters from female Harlequin Ducks and found a lone Long-tailed Duck in the dramatic sea. What spectacular frigid energy we experienced this day on our coast, decorated so unforgettably with the seabirds that call it home for the winter. Canada Goose (~120) – various. Mute Swan (1) – Niles Pond. 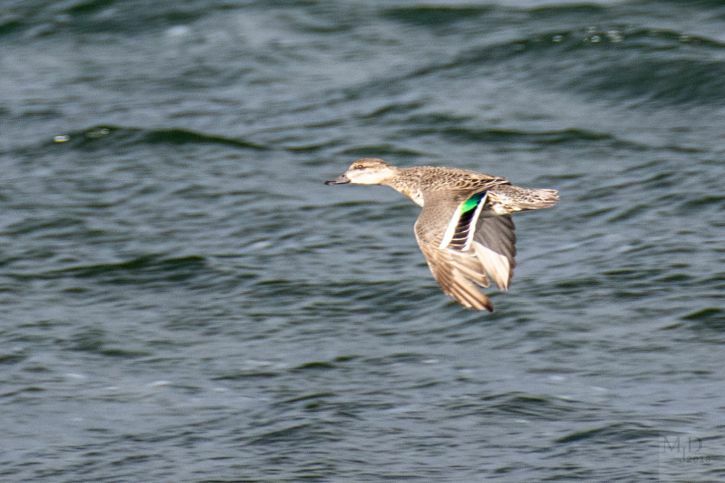 Green-winged Teal (1) – Eastern Point. 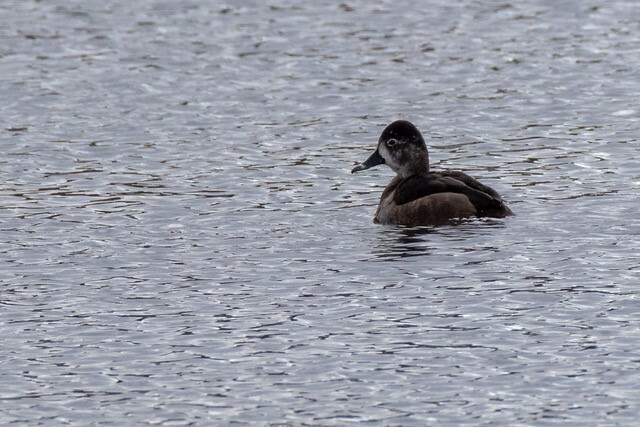 Ring-necked Duck (1) – Niles Pond. Greater Scaup (2) – Niles Pond. Harlequin Duck (~25) – Andrews Point. 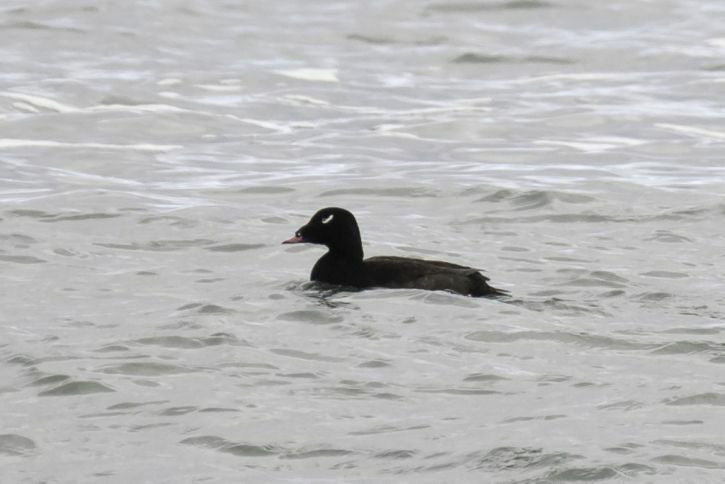 Surf Scoter (~10) – Eastern Point. Long-tailed Duck (1) – Andrews Point. Common Merganser (2) – 1, Gloucester Harbor female: 1, Niles Pond female. 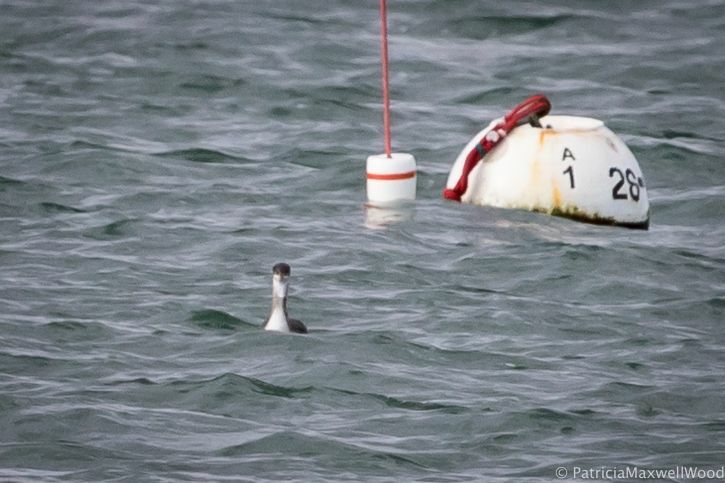 Common Loon (4) – various. Northern Gannet (5) – Atlantic road. Double-crested Cormorant (15) – mostly Gloucester Harbor. Great Cormorant (1) – Atlantic Road. Cooper’s Hawk (1) – Over Rt. 133 Ipswich. Red-tailed Hawk (1) – Gloucester Crossing Shopping Center. Iceland Gull (1) – Gloucester Harbor, from Jodrey State Fish Pier. Great Black-backed Gull – common. Razorbill (1) – Elks Club. Blue Jay (1) – Eastern Point. American Crow (8) – various. Hermit Thrush (1) – Eastern Point. Northern Mockingbird (1) – Rt. 133 Ipswich. Snow Bunting (8) – Over Rt. 133 Rowley. This entry was posted in Birding on November 30, 2018 by David M..